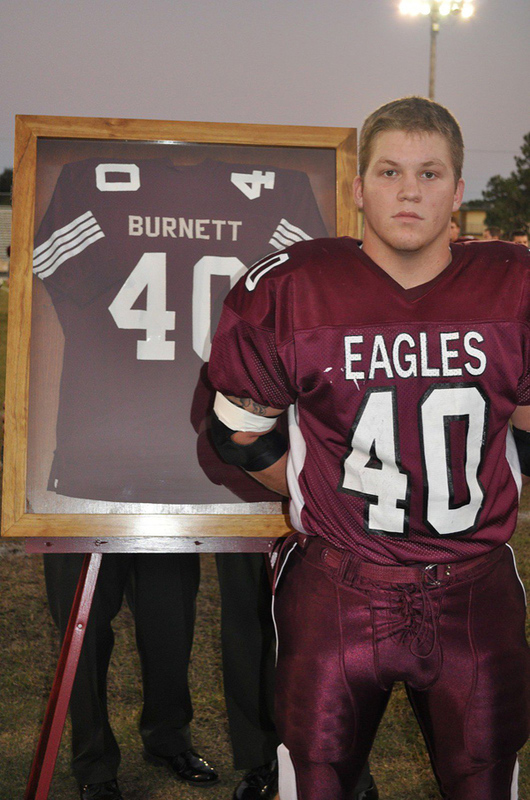 Running Back Cyrus Dooley, who has had a very successful season, shared the number 40 with Brian Burnett, who was being honored in the pre-game ceremony. Brandon High School is rich with history. The football program has been a mainstay in the area for many years. This year, the Brandon High Football Club, alumni and the boosters planned an excitingly nostalgic commemorative ceremony before the homecoming football game against East Bay earlier this month. Along with the regular festivities of homecoming, many former and current players, honored the historic 1969-1970 football team, who were runner-up state champions and very successful academically. Also, Brian Burnett was honored. Brian was the brother of Mike Burnett, who was a member of the ’69 team. Brian also played for the Eagles in high school. The festivities focused on commemorating the ’69 team’s accomplishments and to honor the fallen Eagle Brian Burnett. The Burnett family donated Brian’s jersey, helmet and jacket to the school. Many influential people from Brandon High School’s past attended the event. Alumni came from all around to enjoy the presentation and to honor the rich heritage of Brandon Football. Coach Lima addressed the crowd and made sure to give honor to those deserving. Lima is trying to instill a sense of pride and honor to the current program by showing what has come before them at Brandon High School. “More people showed up than we expected,” said Stanbro. “We were very happy about the awareness of the history of the school. Years ago, Brandon was the only high school in the area. Before many other schools showed up, Brandon was the only option for students in high school. The school will celebrate 100 years in 2014. Brandon High School is trying to put events on like this to build momentum for the huge celebration of their 100th year serving in education in Brandon. To top the night off, Brandon won their game against East Bay by the score of 27-6. This win helped the Eagles along to the playoffs. This event was a great opportunity to remember how strong Brandon High’s football history is. For more information about BHS and the football team, visit maxpreps.com or www.brandonfootball.com. Next articleThanksgiving is today, isn’t it?